Just read our 5-star amazon reviews. Customers say the GSCW is the best wine opener they ever used. Try it and you will become a believer too! Open Up Any Wine Bottle in Seconds! Using traditional corkscrews can cause excessive strain and takes too long. The GSCW Lever Corkscrew is the NEW approach to removing any wine corks, working on both natural, composite, and synthetic corks. Opens up your wine bottles significantly faster in just seconds. To use, just grab your GSCW and attach it to the neck of your wine bottle as shown in the images above. One simple motion bringing the handle up and back down removes the cork from the bottle in about 3 seconds. Removing the cork from the corkscrew is also very easy (after uncorking your wine bottle ) - just do the same motion you just did except now clasping onto the cork instead of the bottle. Gone are the days of wasting your time straining and struggling to open wine bottles. The GSCW Wine Opener Simply Performs Better. Customers say the GSCW is the best wine opener they ever used. And in our testing, the GSCW outperformed and outlasted all the other top selling corkscrews. It also is much easier and an awesome experience opening with the GSCW as well. Why Does GSCW's Corkscrew Perform Better? The GSCW Corkscrew utilizes a globally patented lever process that fully removes any cork from your wine bottle in just seconds. It works 10 times faster than the others. 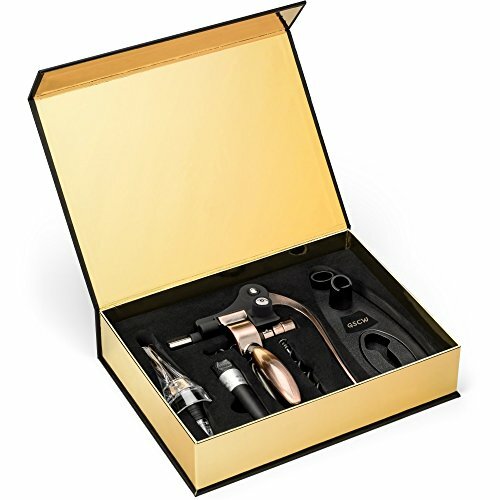 100% Lifetime Satisfaction Guarantee AND Bonus Free Foil Cutter, Display Stand, Wine Aerator, Pump, and Custom Gift Box! We offer a lifetime guarantee. We at GSCW want this to be the best wine opener you've ever used, or we will refund your money. Free lifetime replacement!